The launch ceremony of the Jiangsu-UK 20+20 World-class University Consortium opened in Zhenjiang, Jiangsu province, on April 9. The consortium engaged the first group of 23 universities from the East China province, including Nanjing University, Southeast University, Nanjing University of Science and Technology and Jiangsu University, and 13 universities from the European country, represented by the University of Cambridge, University of Oxford and University of Liverpool. The participants will carry out cooperation in student and scholar exchanges, joint research programs, and joint postgraduate and doctoral student cultivation programs. Yan Xiaohong, president of Jiangsu University (JSU), the secretary-general school of the consortium's Jiangsu side, said schools from the two sides will blend their advantages with each other. "Take my school and the Cranfield University for example. Our joint postgraduate and doctoral student programs in energy, environment and materials will be a step towards sharing JSU's current academic strength and Cranfield's resources," Yan said. 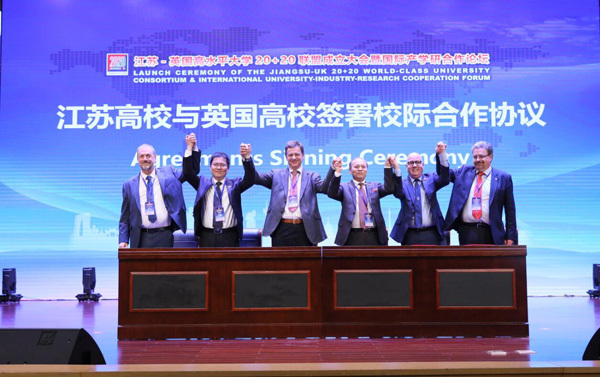 Wiebe van der Hoek, executive pro-vice-chancellor of the University of Liverpool, shared his idea that "the consortium is a platform for experts from the two sides to conduct industry-university-research cooperation. We can seek more common ground in the future and join hands for global issues." The ceremony also saw a common declaration announced, guiding the participants to seek win-win cooperation. In addition, the province has established interschool ties with the United States, Ontario in Canada, Macao and several Portuguese-speaking countries. Statistics from the Jiangsu Provincial Department of Education show that the number of Jiangsu-foreign joint programs for higher education has reached 323, ranking top in China and accounting for 13.5 percent of the national total. Over 2,000 college faculty members from Jiangsu have attended government-funded programs visiting overseas.